Apple (Nasdaq: AAPL), the world’s most valuable technology company, has acknowledged that its iPad made it a major force in ebooks but denied that it’s stifling competition in a formal reply to the Justice Department’s April antitrust lawsuit. In a response to an antitrust complaint that was made by the U.S. Department of Justice in the U.S. District Court in New York on April 11, the Cupertino, Calif.-based company denied the charges and said the iPad had effectively broken an ebook monopoly held until 2010 by Amazon.com Inc. (Nasdaq: AMZN), the No. 1 e-retailer. “The Government sides with monopoly, rather than competition, in bringing this case,” Apple stated in its legal response, which was prepared by Daniel S. Floyd of Gibson Dunn & Crutcher, Apple’s outside counsel. Apple was sued along with five publishing giants for allegedly conspiring to fix the price of ebooks. The others were HarperCollins, a unit of Rupert Murdoch’s News Corp. (NYSE: NWS); Simon & Schuster, a unit of CBS Corp. (NYSE: CBS); Penguin Group, a unit of Pearson PLC (NYSE: PSO); Hachette, an imprint of France’s Lagardere (EPA: MMB); and Macmillan, a unit of Germany’s private Holtzbrinck. All of the defendants have settled except for Apple, Macmillan and Penguin. Since the lawsuit, Apple shares have shed nearly 9 percent of their value. They closed Tuesday at $572.27, up $9.98. Shares of Seattle-based Amazon have declined 1 percent. They closed Tuesday at $214.75, up $1.86. Apple always wanted a 30 percent commission. Rather than use Amazon’s one-price model, Apple always wanted to collect a 30 percent cut from every publisher, a so-called “agency commission.” The reason is that sales through the AppStore, which has sold more than 25 billion items, are based on the same model. Steve Jobs was involved in setting up the eBookstore. Apple CEO Steve Jobs was aware of internal efforts to create the iBookstore as shown in emails to retail Executive VP Eddy Cue a year before the iPad came out. But Cue handled the details and first contacted the publishers as late as December 2009. Jobs, though, personally contacted one senior executive of a publisher “to discuss whether or not the publisher would sign up.” Identities were not disclosed. Jobs died Oct. 5, 2011. Some publishers were upset at Amazon.com. That’s a reason why they talked to Apple about an alternative platform to the Seattle e-retailer because some believed Amazon was selling books below cost. Apple didn’t require them to “contractually adhere to a $9.99 price ceiling regardless of competitive or market conditions,” the brief states. Apple wanted all publishers for the iBookstore. While many of the terms were the same, there was no forced agreement for any of them to commit to Apple. The proposals, though, “were similar” but not intended to fix prices. Apple’s entry into the book market is protected by the First Amendment. A common claim in publishing, Apple said that it is free to engage in book publishing as part of its constitutional rights. Next up: Apple and its co-defendants will likely ask the court to dismiss the case. Barring that, it’s likely the company and its co-defendants will engage in some last-minute bargaining before a trial begins in New York. With cash and investments exceeding $110 billion, Apple could go to trial and pay lawyers forever. Or it could sign some sort of consent decree that would subject it to some kind of judicial or Justice Department scrutiny. Other technology giants, including International Business Machines Corp. (NYSE: IBM) and Microsoft Corp. (Nasdaq: MSFT) are very familiar with that path. Apple will have to write its own book — or ebook — in this case. First Edition Design Publishing, based in Sarasota, Florida, USA leads the industry in eBook distribution.They convert, format and submit eBooks to Amazon, Apple, Barnes and Noble, Sony, Google, Kobo, Diesel, 3M, Ingram, Baker and Taylor, Nielsen, EBSCO, scores of additional on-line retailers and libraries, schools, colleges and universities. The company also has a POD (Print On Demand) division, which creates printed books and makes them available worldwide through their distribution network. The Company is a licensed Apple Developer and a Microsoft Solution Provider. This entry was posted in Uncategorized and tagged amazon, apple, ebook, ereader, ipad on May 31, 2012 by First Edition Design Publishing. First Edition Design Publishing, based in Sarasota, Florida, USA leads the industry in eBook distribution. They convert, format and submit eBooks to Amazon, Apple, Barnes and Noble, Sony, Google, Kobo, Diesel, 3M, Ingram, Baker and Taylor, Nielsen, EBSCO, scores of additional on-line retailers and libraries, schools, colleges and universities. The company also has a POD (Print On Demand) division, which creates printed books and makes them available worldwide through their distribution network. The Company is a licensed Apple Developer and a Microsoft Solution Provider. This entry was posted in Uncategorized and tagged amazon, apple, barnes & noble, bn.com, ebooks, ereader, ipad on May 30, 2012 by First Edition Design Publishing. SAN MATEO, Calif., May 23, 2012 /PRNewswire/ — CourseSmart®, a provider of eTextbooks and digital course materials, today announced the results of a survey revealing college students’ growing reliance on technology. The survey of more than 500 currently enrolled college students found that nearly all college students (98%) who own a device have used it for school and a majority of these students (53%) read eTextbooks frequently. Further, 90% of college students say they save time studying with technology — including mobile devices, digital textbooks, eReaders and tablets. Fielded by Wakefield Research, an independent research consultancy, the survey revealed that technology has become a significant part of students’ everyday lives with the average using three devices daily. A majority (67%) can’t go more than one hour without using some sort of digital technology, with 40% not lasting more than 10 minutes. “The survey underscores the undeniable influence technology has on today’s college experience. As technology continues to evolve and digital devices become integral to the evolution of higher education, it’s encouraging to see the positive impact on learning outcomes as students utilize advanced devices and digital course materials to streamline and improve their learning environment,” said Sean Devine, CEO of CourseSmart. Once the backpack staple, print textbooks are losing their reputation of being indispensable. Only 5% of students say textbooks are the most important item in their bag and a majority of students say they are more likely to bring a laptop (51%) than a print textbook (39%) to class. Digital devices also allow for on-the-go reference to information with 79% of college students reporting they have done a quick search on a mobile device or tablet to verify something right before a test or a quiz. According to the survey, technology is also streamlining students’ studies. The study found that 68% of college students who save time using technology report saving two hours or more each day and nearly one in six students (14%) saving five hours or more. Further, nearly 3 in 5 students (58%) report that they frequently are unable to complete required reading in time for class and of those, a majority (51%) said they would be more likely to do so if they had digital textbooks that could be accessed on a mobile device, eReader, laptop or tablet. Online courses are gaining popularity with 58% of students reporting they have taken an online course, motivated primarily by being able to take the class on their own time (63%), not having to physically be in a class (48%) and being able to learn at their own pace (47%). Even traditional brick and mortar classes, though, are incorporating online elements, creating increasingly hybrid experiences. Nearly all (96%) college students have had online components to a course: a majority of students (79%) have submitted assignments or papers online and 71% have taken online tests and quizzes. According to the survey, communication between faculty and students is becoming more social with nearly one in five (18%) students having received materials from their professor via Facebook. Professors are also relying more on technology for delivering class announcements and assignments: 84% of students have had professors post a class syllabus online and 78% of students have received class news and updates from their professors via campus systems, such as learning management systems or student portals. “As we look forward, we will continue to see technology incorporated into even the most traditional of college experiences and classes. Within this new digital learning environment, students will have access to their entire higher education network, including social, grades, quizzes, textbooks and other course materials, in the palm of their hands,” added Devine. The CourseSmart Survey was conducted by Wakefield Research (www.wakefieldresearch.com) among 500 Americans currently enrolled in college, ages 18-23, between Monday, April 30th, 2012 and Tuesday, May 8th, 2012, using an email invitation and an online survey. Quotas were set to ensure reliable and accurate representation of the total U.S. population between the ages of 18 and 23. First Edition Design Publishing, based in Sarasota, Florida, USA leads the industry in eBook distribution. They convert, format and submit eBooks to Amazon, Apple, Barnes and Noble, Sony, Google, Kobo, Diesel, 3M, Ingram, Baker and Taylor, Nielsen, EBSCO, scores of additional on-line retailers and libraries, schools, colleges and universities. The company also has a POD (Print On Demand) division, which creates printed books and makes them available worldwide through their distribution network. This entry was posted in ebook and tagged college, ebook, ereader, textbook on May 29, 2012 by First Edition Design Publishing. Looking for eBooks will now be a trip in the park with the help of Chatwing chat box. This simple application empowers blog chat, allowing an even greater leverage in online communication. Chatwing is very easy to use and compatible to most blogs. Kindle eBook readers are now looking for different opportunities to download the best eBooks in the cyberspace. Chatwing’s development team has recently observed that Kindle users are hanging out in the chat box to find new friends who can give them the best eBook links that can be downloaded. These Kindle users can take advantage of Chatwing’s ease of access, versatility, high web chat connection rate, and even social media integration. Some Kindle users are maintaining different types of blogs and chatrooms for many purposes. One of the most common purposes is eBook exchange. Through the blog visitors, the blogger will now have a continuous stream of eBook source. Chatwing improves this goal by providing an avenue of communication that is easy and competitive at the same time. Many bloggers have already used the Chatwing shoutbox during its second version release. According to some of these bloggers, Chatwing is ‘simply elegant’ and reliable in terms of online communication. Chatwing’s social media integration has been helping out Kindle users a lot. Through Facebook and Twitter, Kindle users can now find more friends and acquaintances. This simply means an even better opportunity to find more eBooks to download. This social media integration has also benefited a lot of bloggers who are also into online entrepreneurship. In a way, Chatwing provided another easy branch of an online business’ soft marketing process. Installing the Chatwing chat widget doesn’t take much time, especially with the latest version. After registering the blog or website, the user can now proceed to customization phase. Here, the user will get the chance to modify the overall appearance of the widget. This easy installation process has earned the Chatwing website chat tool a great spot in terms of online ranking. Chatwing users are expecting more developments in the coming months. Chatwing.com has developed live chat software for websites and blogs. It caters to different online communities due to its high rate of connectivity. Everyone can create a customizable live chat box in 1 minute or less. Users have the ability to customize the size, color, and fonts of the chat product. The ability to chat via social media accounts such as Facebook and Twitter enable Chatwing to offer a personal and unique real-time experience to all sites. Chatwing is 100% free and very easy to use. First Edition Design Publishing, based in Sarasota, Florida, USA leads the industry in eBook distribution.They convert, format and submit eBooks to Amazon, Apple, Barnes and Noble, Sony, Google, Kobo, Diesel, 3M, Ingram, Baker and Taylor, Nielsen, EBSCO, scores of additional on-line retailers and libraries, schools, colleges and universities. The company also has a POD (Print On Demand) division, which creates printed books and makes them available worldwide through their distribution network. This entry was posted in Uncategorized and tagged chatwing, ebooks on May 25, 2012 by First Edition Design Publishing. The educational e-book market has grown fiercer in the last few years, raising the question of where the end game will leave educational institutions in their attempts to reduce student churn, increase productivity and radically reduce costs. As the battling e-textbook giants try to cut exclusive deals and limit competitors’ supplies of e-content, educators from the kindergarten to university level are wondering if their choices of learning material will be choked as a result. That concern is not unfounded considering that e-books are likely to outright replace paper textbooks in the next 36 months, according to Brian Kibby, president of McGraw-Hill Higher Education. Within the next 12-18 months, entire departments at universities will have replaced paper textbooks completely, Kibby predicted, noting that the trend is already under way. If titans in the e-textbook market limit access to e-content as a means to harm their competition, a learning institution can find itself short of the course material it needs by virtue of choosing the “wrong” device or service. Amazon (Nasdaq: AMZN) rents e-textbooks while Apple (Nasdaq: AAPL) produces the software and service to create them, thereby providing the means to sidestep traditional textbook publishers. Both aggressively cut prices to the bone in an attempt to cripple their competitors. Meanwhile, Barnes & Noble (NYSE: BKS) offers Nook Study, which rents and sells textbooks. The content available from each is not identical. Some books are available on one outlet and not another. However, content on tablets tends to be of more concern to educators than that which is available solely for e-readers, and that has everything to do with how the devices are faring in the consumer market. The more colorful, glitzy and versatile tablets are overcoming their drabber e-ink e-reader cousins. E-readers sales have slumped from 9 million units in late 2011 to a meager 2 million units in the first quarter of 2012, according to Digitimes Research. That doesn’t mean, however, that e-readers are fading away or that educational institutions are turning away from them. Annual e-reader shipments will exceed 60 million units by 2015, the firm forecast. In regard to tablets, the competition, while still fierce, looks to be almost at the point of crowning a winner. Apple reasserted its dominance in the first quarter of 2012 with a staggering lead in iPad sales, claiming 68 percent of the tablet market, according to preliminary data from IDC’s Worldwide Quarterly Media Tablet and eReader Tracker. Overall, tablet shipments tanked by 38.4 percent, mostly due to plummeting Android sales, although Amazon fared poorly too. Microsoft (Nasdaq: MSFT) almost fell off the shelf entirely in tablets, which limits its ability to carve much space in the textbook market — but the company is preparing to push back hard with Windows 8 and its touch-oriented Metro user interface. “The worldwide tablet market is entering a new phase in the second half of 2012 that will undoubtedly reshape the competitive landscape,” said Bob O’Donnell, IDC program vice president, clients and displays. To get a better feel for the effects of e-textbooks on student productivity, the Hofstra North Shore-LIJ School of Medicine’s Health Sciences launched an iPad pilot program and study. With the aid of a US$10,000 Technology Improvement Express Award grant from the National Network of Libraries of Medicine, Middle Atlantic Region, Hofstra set out to determine the effectiveness of the iPad and apps as a tool for medical education. The grant paid for 10 iPads and cases, along with textbook, productivity and medical applications. Ten out of the 40 first-year medical students and 10 out of approximately 30 faculty members involved in the Winter/Spring term received the devices. In-person training and a support website were provided by the library staff. Some of the apps loaded on the iPads included textbooks not currently available via library subscriptions on various platforms; specific information-retrieval apps such as Pubmed on Tap, Micromedex and DynaMed; patient education apps; and a patient log app such as Drchrono, which served the students as a transportable Electronic Health Record. The results of the 12-week pilot study were overwhelmingly positive from students and faculty alike. Students and faculty listed the iPad’s top strengths as portability, ease of accessing materials, and the note-taking and annotation capabilities. The top weaknesses noted by study participants were a “difficult to use” onscreen keyboard and the inability to use Flash content. Further, participants noted that the vendor feature allowing the purchase of chapters rather than an entire textbook was not useful. The iPads were loaded with partial content of medical textbooks required in the school’s curriculum — some 20 chapters from five different textbooks for the purpose of this study. But most study participants said they preferred access to entire textbooks for reference purposes. But using iPads in medical school is not only beneficial to learning the material — it’s also preparation for real-world use in medical fields, a fact that further distances Apple from its e-textbook and tablet competitors. Nearly three-quarters (74.3 percent) of the physicians participating in a study conducted by ON24 and MedData said they either owned or planned to buy an iPad in the next six months. As to whether Apple will force med schools and doctors to use content that Apple provides or will be open to procuring content as the schools and physicians dictate is yet to be seen. Pam Baker has written hundreds of articles published in leading technology, business and finance publications. She has also authored several analytical studies on technology, eight books, and an award-winning documentary on paper-making. She is a member of the National Press Club (NPC), Society of Professional Journalists (SPJ) and the Internet Press Guild (IPG). She can be reached on Twitter at @bakercom1. This entry was posted in Uncategorized and tagged apple, ebook, ipad, tablet on May 24, 2012 by First Edition Design Publishing. Search engines may make it easy to find information, but they don’t necessarily do the same for learning it. That’s why the founders of social test prep startup Grockit want to re-configure online content such as YouTube videos, Wikipedia entries and ebooks into ordered lesson plans. 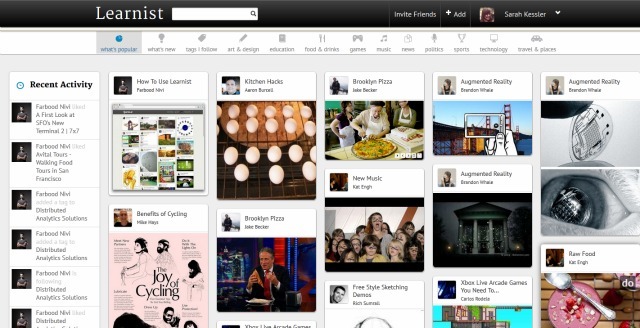 Their new product, Learnist, works a bit like a Pinterest for learning. Soon anyone (the capability is still invite-only at launch) will be able to compile content pieces onto a board or “learning.” A nifty bookmarklet makes it easy to collect content from other sites. Unlike Pinterest, however, creators suggest a path in which to consume each content component. Users can check off each component as they go or “re-add” it to one of their own learnings. So how does Learnist beat Google as a learning tool? Or Pinterest, for that matter? Grockit founder Farbood Nivi argues that expert curation helps avoid the misinformation, hacked-together how-to articles and other useless content one must weed through in a typical Google search. It also provides a clear learning path and eventually, he hopes, will include some form of assessment. The scope of content he has in mind is larger than that of both online course platforms such as Udemy as well as that of Sophia, a startup with a similar mission of helping experts curate content that focuses on academics. Along with lessons about common core standards, it includes topics such as “how to find the best pizza in Brooklyn” or “how to hack your kitchen” that don’t require courses. He wants to replace not just textbooks, but also how-to articles. Grockit will continue to offer its test-prep service for $30 per month, but it is focusing on Learnist going forward. Grockit’s social, adaptive learning question sets are now embeddable within Learnist boards. This entry was posted in Uncategorized and tagged ebooks, grockit, learnist, pinterest on May 23, 2012 by First Edition Design Publishing. Speed Reader? Take This Test! KANSAS CITY, MO. — Think you’re a fast reader? Want to put your reading skills to the test? Well, now, thanks to Staples.com, you can. Are you a “skimmer” or a reader? The idea is that you can be a really fast “skimmer” but if you don’t remember what you’ve read — were you really reading? In today’s Internet age people tend to skim paragraphs looking for key words. Doing so bumps up your reading rate to about 700 words per minute — but you also lower your comprehension rate. Still, if you’re looking for key words for pinpointed information, this style of reading can be beneficial. On average, adults read about 300 words per minute. According to Staples, the speed reading record is 4,700 words a minute. If you think you can beat that and want to put your reading skills to the test, Staples has created just the thing for you. 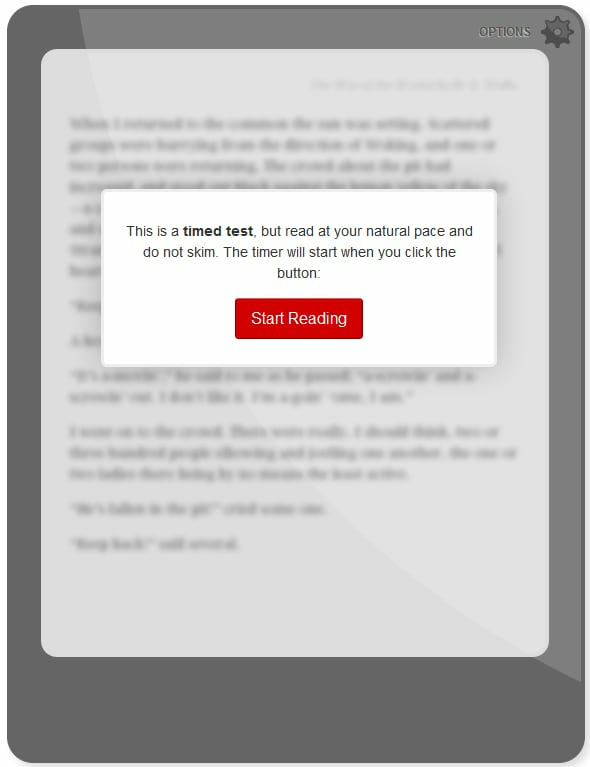 Staples’ timed test allows you to compare your reading skills to the national average. But don’t skim because you’ll also be tested on your comprehension via three quiz questions. This entry was posted in Uncategorized and tagged ebooks, ereader, first edition design publishing, reading, staples on May 22, 2012 by First Edition Design Publishing. The lure of an Apple Store can be so great that local authorities are doing all they can to sweeten the deal for the world’s biggest technology company, waiving rents and taxes in order to have it set up an Apple Store in their area. New York’s Grand Central Terminal wanted Apple so bad it dropped its leasing fees and in Salt Lake City, authorities are rumoured to have dropped rents completely, to incentivise the opening of a new Apple Store. As a business, Apple’s retail stores are booming. In its second financial quarter (ending March 2012), the company saw sales rise by some 90 percent, breaking records with a $24.67 billion in quarterly revenue and $5.99 billion in profits. A staggering 71 million customers visited Apple’s retail stores between January and March, an increase of 28 million from a year earlier. Apple’s impressive footfall is proving to be a catalyst for retail spending in the areas in which they are located, pushing the money spent back into the local economy. A recent ABC News report states that Apple is going to open a new store in Salt Lake City, located in City Creek. The company already has one store in the the Utah city but thanks to what appears to be a massive retail incentive, it may open a new store before the end of the year. What is the big incentive? According to ABC’s sources, City Creek has offered a “major concession package” that is thought to include five years free rent. The truth is, realtors and local authorities know that when an Apple Store is opened in an area, tech savvy consumers come from surrounding areas to view products, seek help and spend money on luxury electronics. Put simply, spending will flow into City Creek. The rental deal isn’t a one-off either. While authorities will never confirm it — even City Creek’s Marketing Director said it “does not release the terms of its leases” — Apple’s lease for its impressive store in New York’s Grand Central Terminal is a third of that paid by other retailers and restaurants in the area. In fact, the lease is costing Apple $60 per-square-foot, where other retailers are expected to pay $200 for the same area, and it has escaped having to share any of its revenue with Grand Central’s operator, the Metropolitan Transportation Authority, according to papers obtained by the New York Post. Apple’s success was directly benefitted other companies in the Terminal. In just seven weeks, Apple’s newest New York store helped one restaurant boost sales by 7 percent — impressive as it’s already co-owned by basketball legend Michael Jordan. Apple is showing no signs of slowing its retail expansion, it’s already seeing an average of 22,000 customers, per store, per week. Of course, it wants to further increase that figure. As of January 2012, Apple operated 363 stores and has opened a small number since then. In 2012, it has plans to open 40 new stores, including a handful in China, perhaps its most important market. In order to facilitate this, Apple has allocated $900 million for its new stores, some of which have been confirmed in Germany, Spain, France and Australia. Apple’s retail success is down in part to its customer service, ease of purchasing, level of detail in its stores — and the quality of its products. However, the company isn’t completely satisfied with its operations, and has brought aboard former Dixons CEO John Browett to drive its retail business forward. Part of this plan apparently involves automating its sales processes, which includes investment in its ‘Personal Pickup’ service, which allows customers to buy products online and pick them up from their local Apple Store. Apple also launched a new iOS payment service called EasyPay, providing a simple way for customers to enter an Apple Store and pay for their purchase using their iPhone, without having to seek assistance from a sales clerk. The company is set to release a new iPhone and update its range of Mac computers in the coming months, no doubt incentivising Apple fans to return to their local store to check them out. As it stands, the company is setting the standard for retail, with other technology companies — including Microsoft — rushing to open similar stores and build rapport and most importantly gain trust from their customers. Apple might be benefitting from its success, in terms of the money it saves from leases, but companies in the vicinity of an Apple Store don’t seem to mind. It’s difficult to complain that a company is getting preferential treatment when it helps boost your own revenues and increase the number of people coming to the area. This entry was posted in Uncategorized and tagged apple, ibookstore, ipad, real estate, retail on May 21, 2012 by First Edition Design Publishing. For bookworms there have never been so many ways to read a book and local libraries are trying to meet the demand. While grocery stores may ask their customers, paper, or plastic but local libraries are asking their patrons print, or electronic. Libraries throughout New London county and Rhode Island are using e-books as a way to modernize with the industry. The Waterford Public Library began offering downloadable e-books and e-audioboks in November of 2011 as way to meet the growing demand of their customers. “By offering e-books the library is doing what it has always done—making books available to the widest possible audience for free—hardcover books, paperback books, audiobooks and now digital books,” Waterford Public Library director Roslyn Rubinstein said. Waterford Library patrons seem to love the new service. According to Rubinstein in the eight weeks since they launched their e-book borrowing service almost 250 customers have borrowed eBooks through the library. While Rubinstein said the Waterford Library’s circulation of all materials has increased over the past few years the Stonington Free Library said their circulation decreased in 2011 but seems to be increasing with the e-books so far in 2012. The Stonington Free Library began offering a number of downloadable forms including e-books in the spring of 2011. Library Director Margaret Victoria said ebook borrowing has started to increase in the fall of 2011. “The offering of books in a variety of formats, loaning movies, music, offering Internet access, photocopiers, faxing, word processing (it used to be typewriters), and now loaning e-books and e-readers is the way we serve our community,” Victoria said. The Stonington Free Library and 12 other libraries in the service area of the Eastern Connecticut Community Foundation gave a grant of $100,000 to use as appropriate for their community. The Stonington Free Library used half of the money for technology services as way to meet the needs of their patrons by offering e-books. Just over the border in Rhode Island, library patrons are old hands at eBooks. According to Nina Wright at the Westerly Public Library as part of the Ocean state Libraries began adding e-books to the statewide share catalog in 2006. In 2007, Westerly Public Library patrons checked out 305 e-books, last year in 2011 that number was up to 4,379. This entry was posted in ebook and tagged connecticut, ct, ebooks, library on May 19, 2012 by First Edition Design Publishing. According to the Association of American Publishers the main facets for international growth was international sales, marketing and distribution. US publishers saw sales of trade titles increase to countries across the globe from the year 2010-11, due to internet access to a full range of English language titles, particularly those unavailable in many markets, the rise of eBooks internationally and new readers. Michael Kozlowski is the Editor in Chief of Good e-Reader. He has been writing about electronic readers and technology for the last four years. His articles have been picked up by major and local news sources and websites such as the Huffington Post, CNET and more. Michael frequently travels to international events such as IFA, Computex, CES, Book Expo and a myriad of others. This entry was posted in ebook and tagged digital publishing, ebooks, publishing on May 18, 2012 by First Edition Design Publishing.